Anyone who performs at the highest levels has a coach, think about professional athletes. The same is true for anyone, in order to live an extraordinary life of both success and fulfillment, it’s imperative to have a coach. This unique immersion is an opportunity for you to master the skills necessary to creating lasting change in your clients. Whether you are a Yoga Teacher, a Life Coach or a Healer, this immersion will be exceptionally powerful for you. Are you interested in creating lasting change? Do you welcome adversity as a source of personal growth? Would you love the ability to live in a blissful state in any moment? If you are eager to explore transformation and breakthrough philosophy, and how this can impact your yoga practice – this program is for you. You will experience and learn how to breakthrough limiting beliefs and transform the area of your life that is most important to you. Happy Jack has the extraordinary opportunity to be Platinum Partner and friend of Tony Robbins. Together we will draw upon the power of this transformational work and apply it to your yoga practice, your yoga teaching and your life coaching. 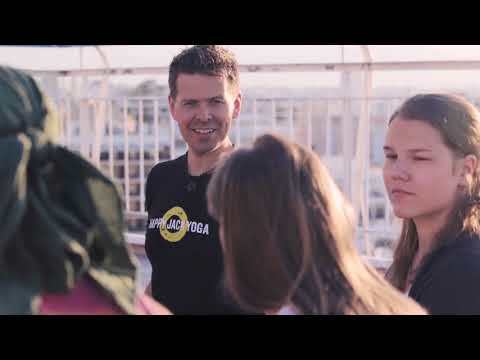 In addition to the connection with Tony, Happy Jack has trained with countless leaders and coaches, and has studied yoga for several thousand hours, both in India and in the West. A breakthrough is a moment in time when something impossible becomes possible. Using the Happy Jack Yoga methodology, you will create and experience incredible breakthroughs, both on and off your mat. This​ ​is​ ​your​ ​time.​ Are you ready? 10% Discount for enrolling with a friend. You and your friend will both receive the discount. $500 USD non-refundable deposit required to confirm your spot in the training. In the event you are unable to join the training, your payment can be transferred towards another HJY program. We are committed to your success. If after the first two days of this program you feel that you have not received value from this program, we will refund your full tuition amount. No questions asked. A few of the greatest breakthroughs I have accomplished in my life have been; losing 100 pounds, getting sober alcohol & drugs & thriving the process of divorce and healing from cancer. These were of course major milestones in my life, however the amazing things about the Breakthrough methodology we will share during this training is that transformation is available to us in every moment. Inspired by the most powerful content of my friend & mentor Tony Robbins, we have created the Breakthrough Immersion which will transform your teaching and your life. Compress decades of growth into one week at this powerful Breakthrough Immersion in the Canadian beauty of Muskoka! This retreat has limited space and will sell out quickly. To reserve your spot, click the button below now!